SALEM, Mass. 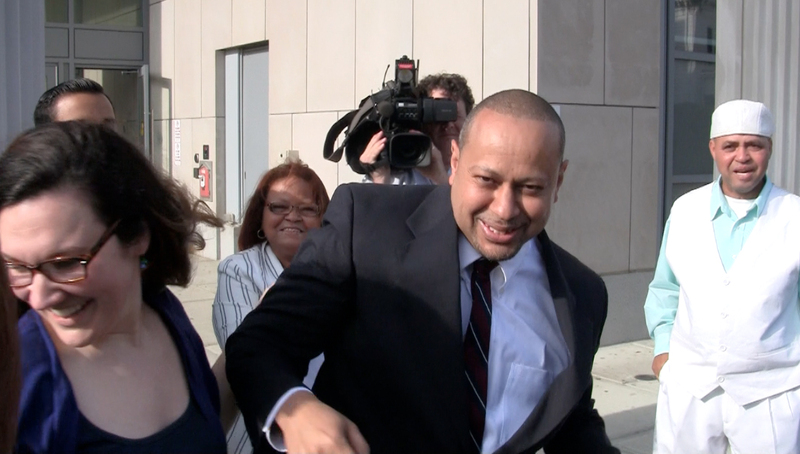 -- Twenty-one years into a life sentence for a murder conviction that was overturned April 30, Angel Echavarria was set free yesterday at Essex County Superior Court in Salem. Judge David A. Lowy vacated Echavarria's murder conviction and ordered him to wear a GPS tracking ankle bracelet until Essex County prosecutors decide whether to retry him, appeal the judge's decision or drop the case entirely. Other conditions of Echavarria's release include staying in Massachusetts and not applying for a U.S. passport. Echavarria is originally from the Dominican Republic. "It means a lot to me because I've been suffering a lot in there," Echavarria told reporters gathered outside the courthouse. "Because I am innocent, I knew it would come. I never gave up.... When you're innocent, you keep your hope." "We are deeply grateful that the criminal justice system has finally recognized that Angel Echavarria never received a fair trial," said Florence Graves, founding director of the Schuster Institute for Investigative Journalism at Brandeis University. The Justice Brandeis Law Project, which is part of the Schuster Institute, has been investigating the case since 2005. "The evidence against Angel was deeply flawed and there was no physical evidence against him. We are thrilled that he has been able to reunite with members of his family after 21 years." The bail hearing was delayed when the judge's clerk informed him that a request from immigration authorities that Echavarria be detained for 48 hours had just been filed. During a court recess the agent who filed the request was contacted and agreed Echavarria's release with a GPS monitor would be sufficient. Family members have confirmed that Echavarria had a green card and was lawfully in the country. "I want to say thank you to everybody who made this happen," Echavarria said outside the courthouse, gesturing to his lawyer, Leslie O'Brien, and the crowd of students and staff from the Schuster Institute for Investigative Journalism. Essex County prosecutors have until June 16 to decide whether to retry Echavarria. They must decide by May 30 whether to appeal the judge's decision to allow a new trial.